With Baden-Baden and Armenia both winning today, four teams have booked their ticket to the live PRO Chess Leagues semifinals in San Francisco this May. The Snowballs and the Eagles join St. Louis and Chengdu in qualifying for the event. With Tuesday's action coming to a close, the results mean that three of the four contestants will be returning to the semifinals, as Ljubljana was relegated during regular season play. The semifinals will see a rematch between St. Louis and Armenia, as Chengdu will take on newcomer Baden-Baden. #prochess playoff success hung in the balance in these GOTW candidates. Vote now! General manager CM Artak Manukyan made a key change to Tuesday's lineup by placing IM Shant Sargsyan on third board. Sargsyan, who had missed Armenia's regular season matchup against Tbilisi, had consistently registered dominating performances for the Eagles in the regular season. While Armenia's dominant performance kept the Gentlemen out of contention in this match, Tbilisi will be back in 2020 for more editions of this budding rivalry. 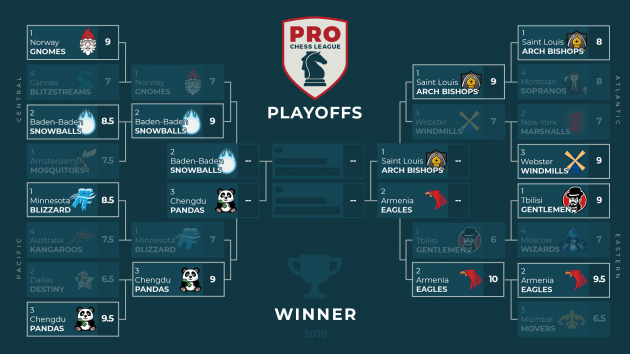 But for now, the Eagles can focus on defending their PRO Chess League title first. Both teams had something to prove heading into the central division quarterfinal. The Gnomes were playing their most important match since the 2017 PRO Chess League final, as Norway had narrowly missed the postseason in 2018. Baden-Baden (formerly Stockholm), had suffered its own bad luck in the postseason, losing to Norway in the 2017 PRO Chess League semifinals, and then a dramatic first-round exit against Ljubljana after dominating the 2018 regular season. However, with draws coming from both Meier and Kollars, the match finished 9-7 in favor of the Germans, as the Snowballs clinched their place in the live semifinals this May. Baden-Baden will take on the Chengdu Pandas in San Francisco, the first-ever matchup between the two teams. Commentary for this week of #prochess was provided by Robert Hess, Alexandra Botez, and Danny Rensch. All shows and archives are available at twitch.tv/chess.